Click here to take the Kitten Quiz, Pt. 1 and Pt. 2! Kittens, usually born in a litter of three to five, are born deaf and blind. They are helpless and require their mother to feed them and keep them warm. They can see after about ten days, and hear after fourteen days, although some breeds can see and hear earlier than this. A kitten’s fur is soft and downy until the adult awn and guard hairs are grown. Kittens are also normally born with a lighter fur color than what they will have as an adult. Their fur starts to change colors and can develop patterns beginning at one week. The fur can continue to change until the kitten is up to three years old. All kittens are also born with blue eyes, which will start to change to its original color after two to three months. 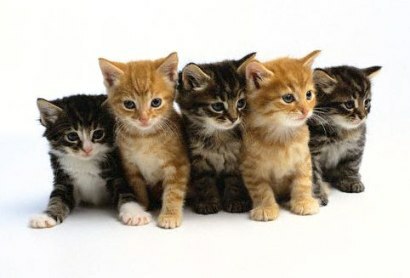 In terms of feeding, a day old kitten should be fed every two to four hours, while an eight week old weaned kitten should be fed three to four times a day. A kitten that is six months old should be fed twice a day from then on. From kitten-hood to adulthood, their diet should include both moist and dry food. Cats and kittens often don't drink as much as they should, and because moist food is normally 70 -75% water, this helps them receive all the water they need to prevent illness and keep them healthy. Because a kitten's milk teeth start to develop at around two weeks of age, a kitten can start eating solid food at around three to four weeks. This solid food, however, should contain larger quantities of vitamins and minerals than regular cat food that kittens need more of including protein, calcium, fat, phosphorus, and vitamin B. A kitten is protected from disease when it is little because its mother's milk has colostrum in it. Colostrum contains antibodies, and these help immunize the kitten for a short time. The colostrum disappears from the milk at about six to eight weeks, around the time a kitten should be weaned. This is when a kitten’s first vaccine, the FVRCP, should be received.